In-room kitchens sofa beds and free Wi-Fi and breakfast entice guests at the non-smoking Residence Inn Portland Downtown/Waterfront a block from Portland Harbor. All 179 suites feature well-equipped kitchens at the five-story non-smoking Residence Inn. Floor plans range from studios to two-bedroom units all outfitted with sofa beds free Wi-Fi and 37-inch HDTVs. Each morning guests refuel at the complimentary breakfast buffet. The hotel has an exercise room and business center. There's also a lounge with a fireplace and bar where guests can unwind after busy days. For snacks check out the lobby convenience store. 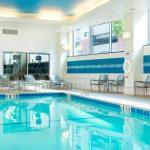 The indoor pool is a great place to keep kids entertained while adults soothe tensions in the hot tub. A free airport shuttle guest laundry facilities and available parking round out the amenities list. Pets are permitted for an additional charge. A block from the waterfront's Eastern Promenade Trail the Residence Inn is a 10-minute walk from the heart of Portland's dining and shopping district. The waterfront with its various lobster roll eateries is also within a 10-minute stroll. A mile away guests peruse masterpieces at the Portland Museum of Art or step back in time at Victoria Mansion. Other points of interest include the Portland Observatory a 10-minute walk and several breweries within five miles. Transportation options include the ferry terminals five minutes by foot Amtrak at the Portland Transportation Center three miles away and Portland International Jetport a five-mile drive.